Portland-based media company MEDIAmerica, publishers of Oregon Business magazine and the well-known 100 Best Companies to Work for in Oregon survey, have announced the second annual 100 Best Fan-Favorite Destinations in Oregon for 2018. This year researchers studied 38,000 reviews, a 72% increase over last year’s reviews, on the most widely-used online review sites Google, TripAdvisor and Yelp. Scores were tallied and combined to determine the level of travelers’ overall satisfaction. The scores were then ranked to create the 100 Best Fan-Favorites Destinations list. 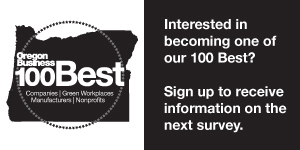 The “100 Best” will gain valuable exposure in popular statewide magazines like Oregon Home, Oregon Business, both in print and online. Winners may also promote their achievement with exclusive rights to use the “100 Best” logo on their promotional materials and at point-of-purchase. The top 100 destinations will once again be charted on a map for visitors and residents to use as a guide for traveling the state. A total of 75,000 statewide maps will be distributed in 2018 at most of the state’s entry points and visitor centers. “It is fantastic to see this project grow. Travelers rely more than ever on third party reviews. The participation increase in this important research shows that more destinations are paying attention as well.” says Andrew Insinga, CEO of MEDIAmerica. Destinations wishing to sign up for consideration in the 2019 100 Best Fan-Favorite destinations survey should click here. Participation is free.